You don’t have to pay the Earth for a beautiful Lake District holiday cottage with Hot Tub. No ordinary hot tub either; it’s a spacious hydrotherapy spa, encompassing six different seats with a multitude of massaging jets. All this is accompanied by cascading fountains and atmospheric lighting. Simply perfect for relaxing in after a day’s walking or sight-seeing in the Lake District national park. Let it get to work on those stiff muscles or soothe that troublesome back. Multiples of bubbling jets in seats of different depths work from the toes right up to the neck. Open all year round and heating you to the core on a chilly winters eve, the lodge with hot tub guarantees a truly comforting experience. 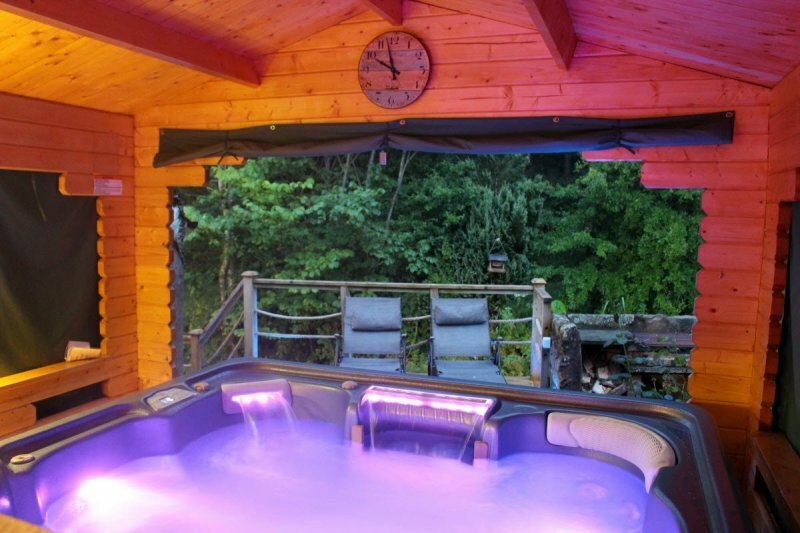 The Hot Tub is exclusively for the use of guests at Cottages Made For Two and is bookable solely for your own private sessions. The Hot Tub is exclusively for the use of guests at Ellen Hall (Cottages Made For Two). Truly ideal for spending quality time with you partner. Enjoy a peaceful moment or two together and still feel part of the great outdoors. 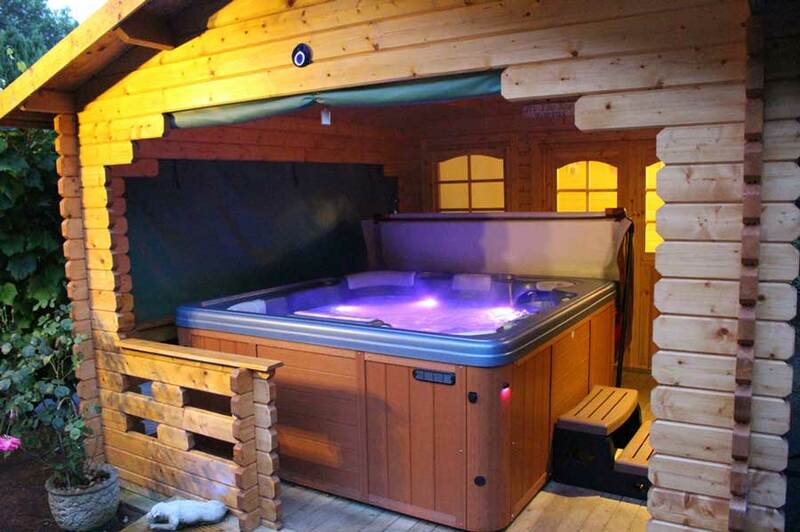 The lodge with Hot Tub comes with its own changing facilities and well stocked drinks chiller. For summer holidays, the sun deck overlooking the beck running through the grounds, is a serene peaceful spot. Bookings are made during your stay and are available from the morning right through to the evening. What an amazing way to end the perfect day exploring the Lake District. Although our cottages are Dog Friendly, the Hot Tub is just for humans! Whether you’re staying in one of our Stables cottages or our luxury accommodation, this 6 seat hydrotherapy spa is available to book throughout the year. Indeed, in winter it is a truly romantic, cosy and sumptuous occasion. Winter in the hot tub * Comprehensive instructions for the use of the Hot Tub and its booking can be found in the welcome folder placed in all cottages. Available for private hire to cottage guests only, please remember to bring swimming costumes and towels. * Only 2 people are allowed to book the hot tub at any one time. Booking instructions can be found in the cottage welcome pack. * Private sessions are for a maximum of 45 minutes at a price of £10 per couple/cottage (longer bathing times than this are strongly advised against). 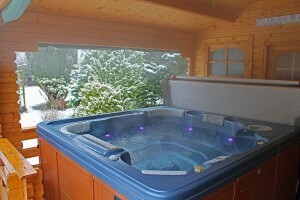 * The Hot Tub is usually closed Sundays for servicing. * Evening booking times will vary according to season. * We require that the instructions (in cottage) are read before booking the Hot Tub. * If you have a medical condition i.e pregnancy or heart illness, you should consult your doctor. * Smoking is not permitted in or around the Hot Tub area. * Pets are not permitted around the spa area.